Happy September, friends! We've been back to school for about three weeks, but I wanted to post a little about our first day of school (sorry this is so late -- you know how crazy BTS can be)!!! I wanted to share this "Classroom Idea" for Laura from A Grace-Filled Classrom's blog linky! This was something that was new this year, but definitely an event I plan to do again in the future! I've been so impressed with the way that the Ron Clark Academy (if you don't know what this is -- talk to me!! It's like Disneyland for teachers!!) 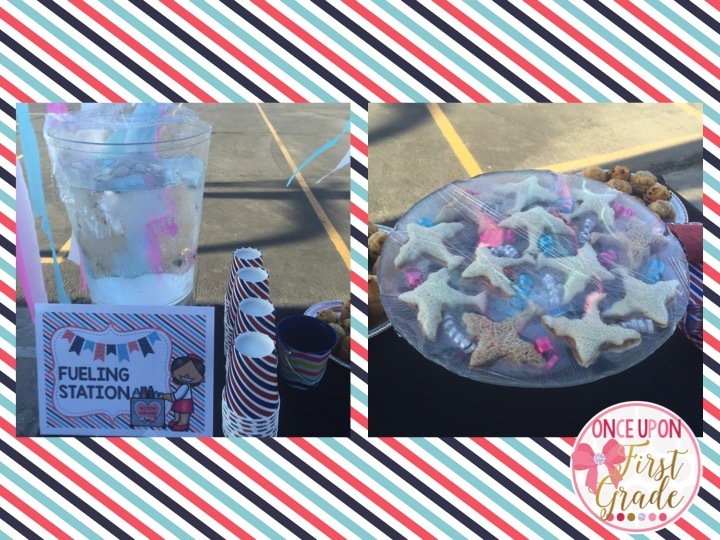 begins each school year with a celebration. I decided to kick off a new year with a special celebratory event for my firsties and their parents! 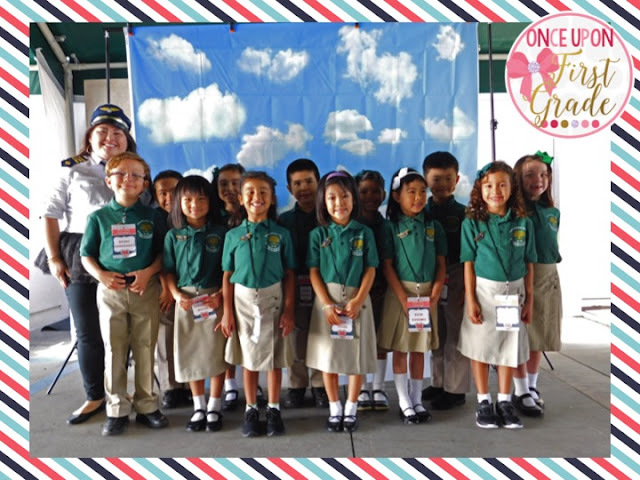 A few months before school started I began planning a "Flying Into First Grade" airport-themed adventure! Here's a little sneak peak into what we did!! Hope you enjoy! 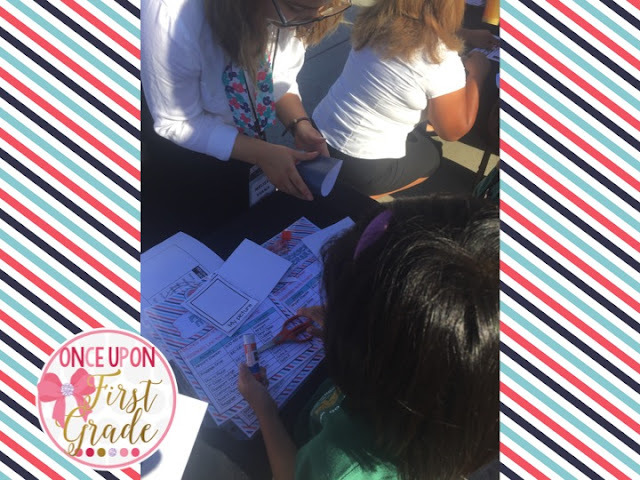 At orientation the Saturday before school started each of my firsties received a "travel kit" equipped with all of the things they'd need as we flew into first grade! 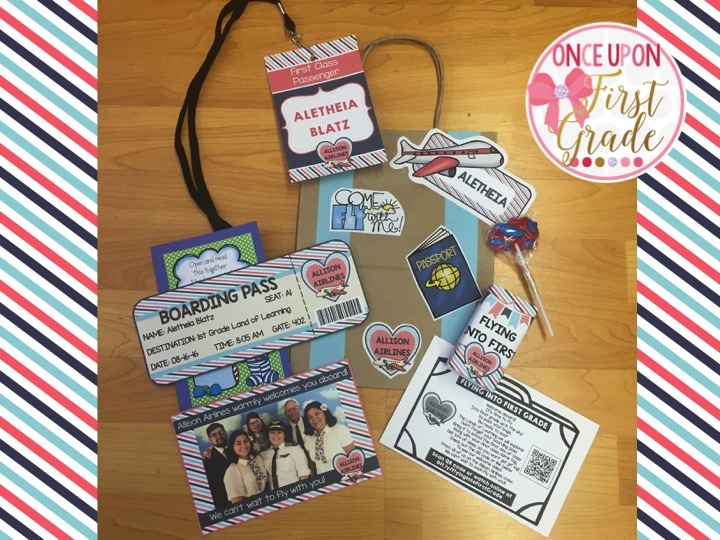 Their kit included their boarding pass, first class passenger name tag, welcome card, and some treats. Each travel kit had a welcome card with a poem and QR code to our welcome video to get the students prepped and excited about the year. You can check out our WELCOME VIDEO HERE. To help really "sell" our adventure of flying, I transformed my classroom into an airplane and the back parking lot right by my room into an airport! Students cycled through a series of activities at the different airport gates before we boarded the plane. The Allison Airlines crew (composed of my family, friends, former first grade parents, etc.) were amazing at helping to run each station and activity! There is no way I could have done it without them!! Thanks SO MUCH!!! 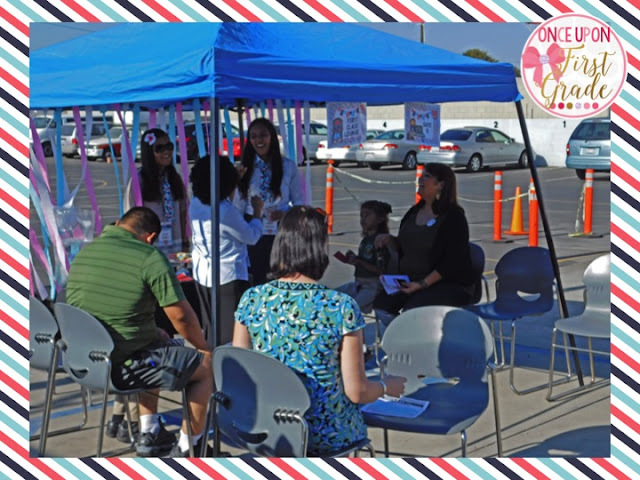 When the students arrived the first day, they came to the Airport Check-in table. 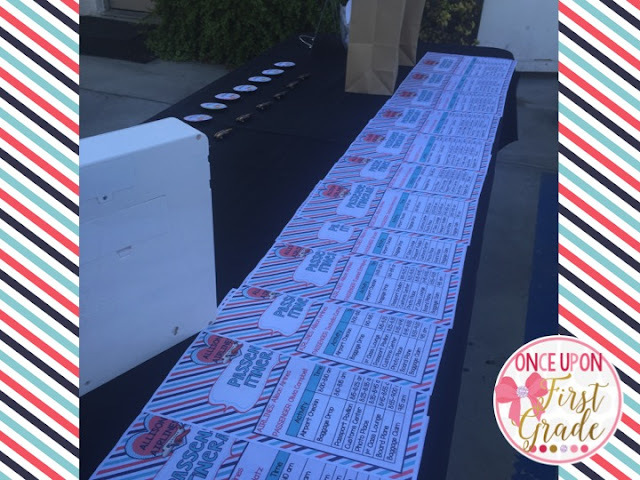 Here they showed a crew member their boarding pass and name badge! 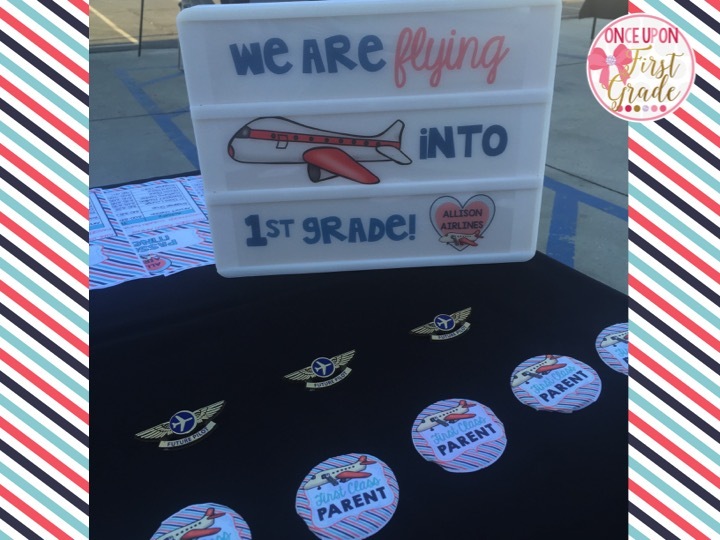 Students were then given their pilot wings, and parents got to put on their "First Class Parent" badge! Each student was also given their own travel itinerary. 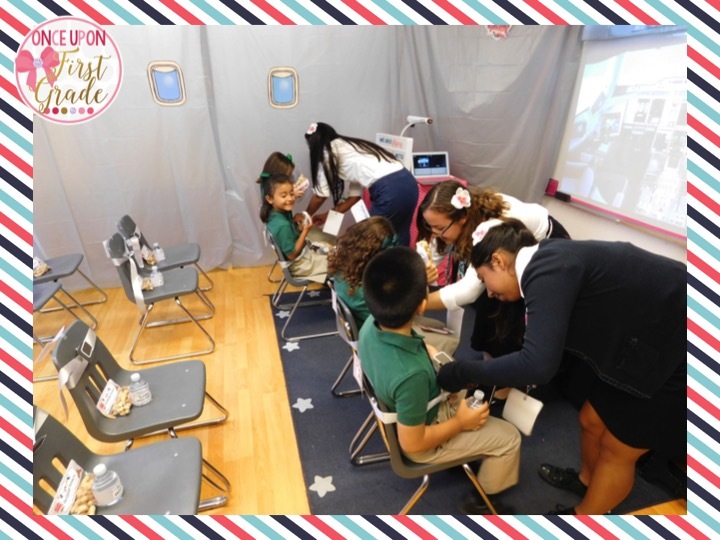 Since there were so many stations, each child had a specific schedule that listed stations to visit at what times. All stations were marked by their airport gate! 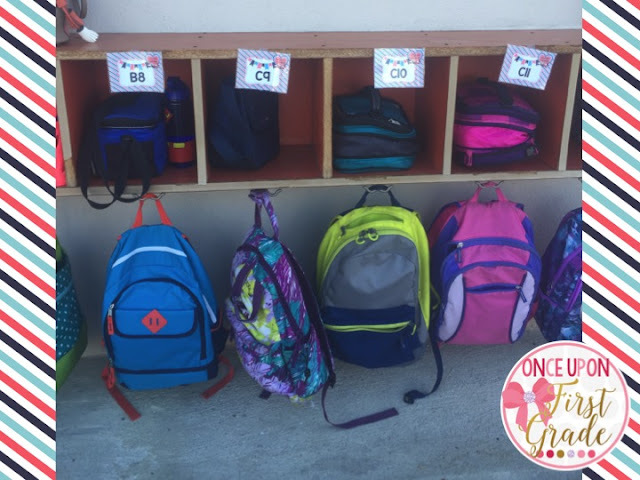 After checking in, each student dropped off their baggage. They used their seat number to know which cubby to place their luggage in! 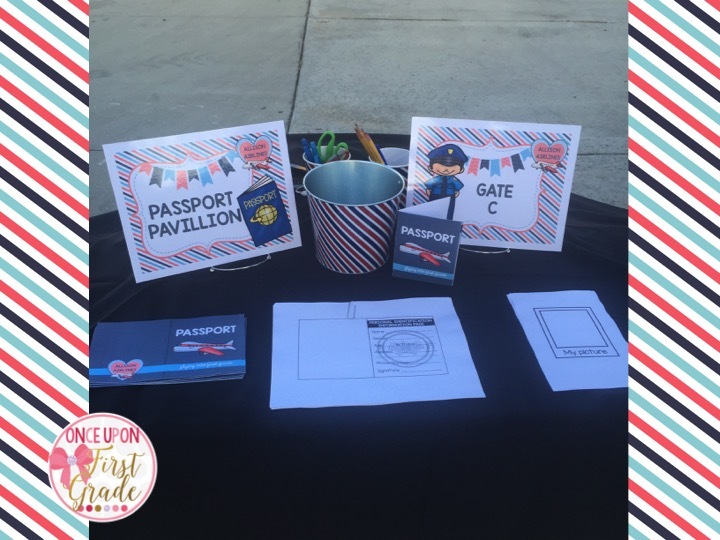 One station that the first grade passengers visited was the Passport Pavilion. Here Allison Airlines crew members helped the firsties put together their own passport. We used these later in the day when we went on a scavenger hunt through the school (learning about where the bathrooms, office, etc. are). At each station on the scavenger hunt they got their passport stamped! Here are some of the crew members helping the travelers put together their passports! Another station the travelers got to enjoy was the First Class Lounge. 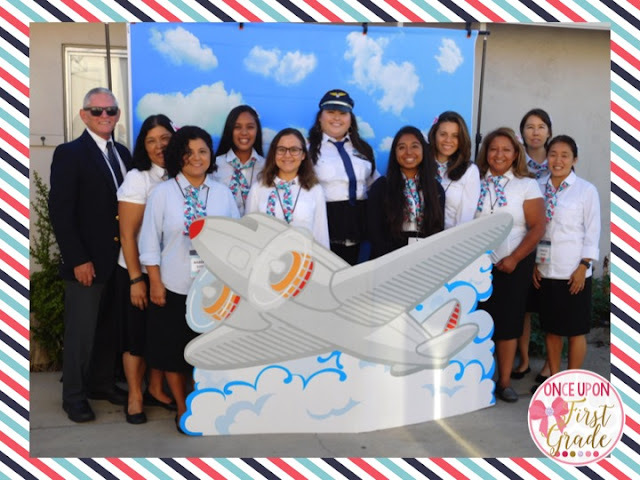 Here they were able to visit the Fueling Station for drinks and eat some yummy airplane sandwiches! 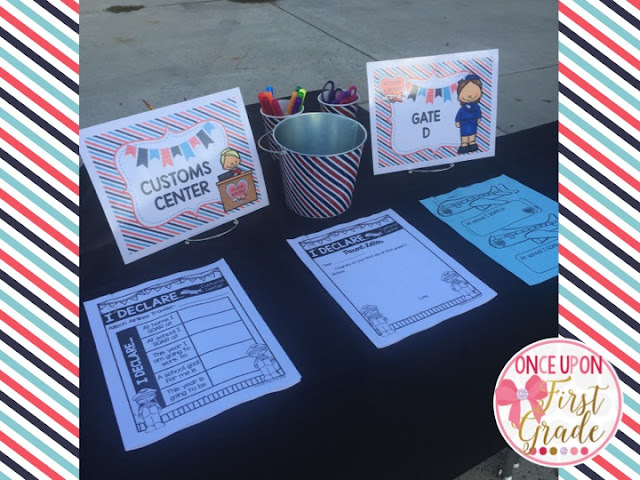 At the Customs Center, students and their parents "declared" things. They worked together to declare areas they soared in, areas they wanted to work on, etc. 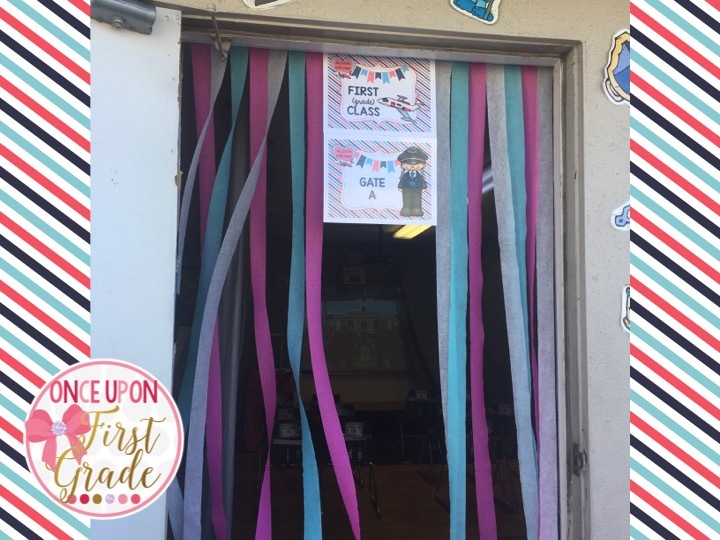 Since it was the first day of school and I didn't really know each of my students' strengths and areas of growth, having the parents work with their child to declare goals was awesome! Also, the parents had the opportunity to write a letter to their child declaring wonderful things about them! If you have ever been outside an elementary school classroom on the first day of school, you know that parents always want to get pictures! 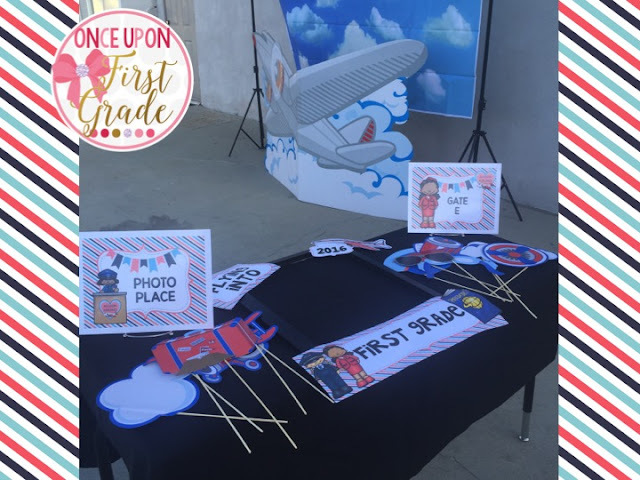 I wanted to have a photo booth area so that I could get pictures of each child as well as allow the parents the opportunity to get pictures of and with their child. I had a sky backdrop, airplane cutout, photo frame, and fun props for them to use! Here's a photo of one of my firsties and her family! After the students had rotated through all four stations, we took one class photo before we boarded the plane! 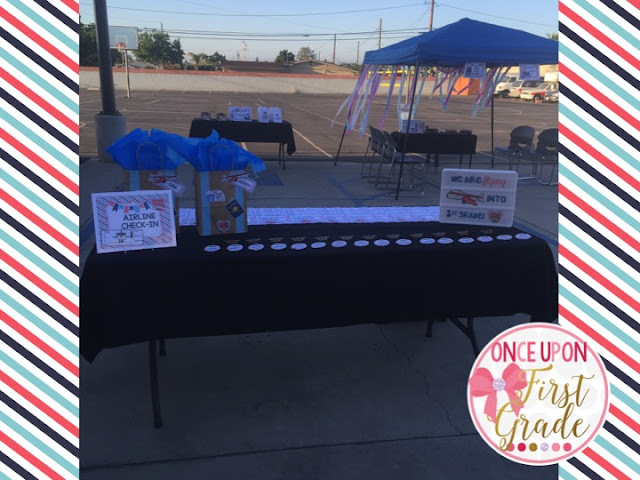 Up until this point, all of our activities had taken place outside! 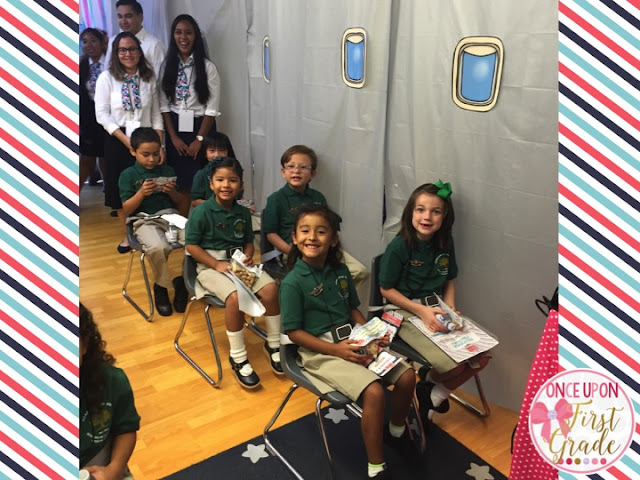 When it was time to board our plane, the students lined up outside our classroom with their boarding passes. 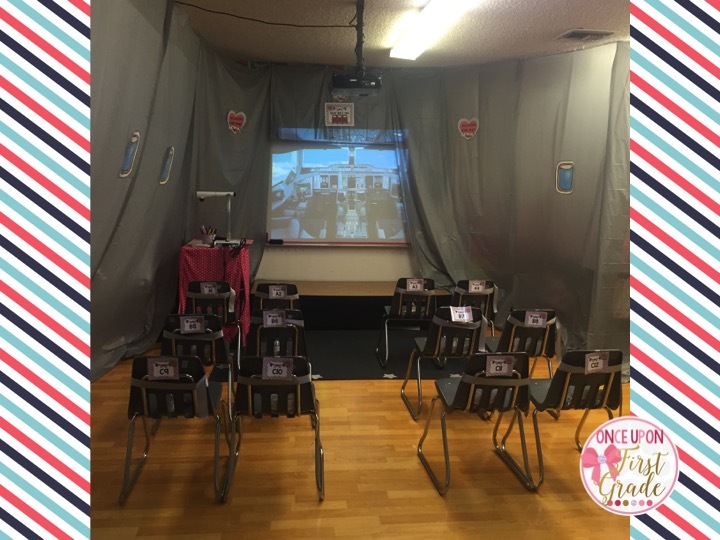 Here's what our transformed classroom looked like. I hid all the desks and covered the walls with grey sheeting and then added some "windows." 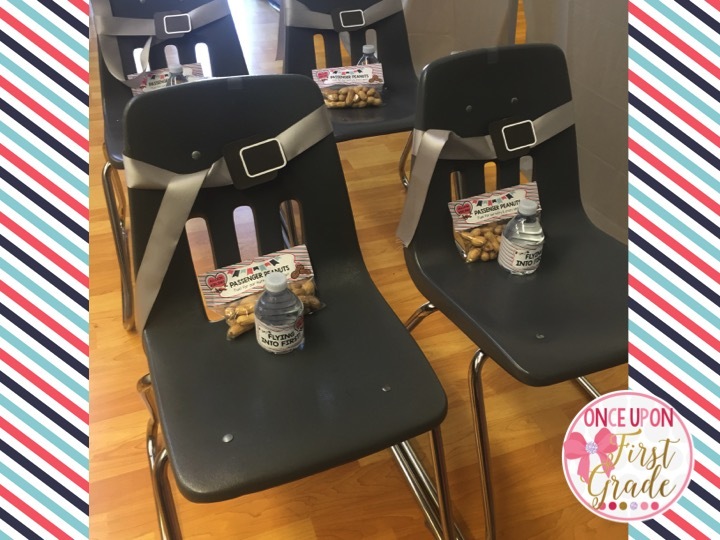 The chairs were arranged in rows with seat numbers on the back so that each student knew where to sit. I also projected a photo of a cockpit on our screen. There were also plane noises in the background which really added to it feeling like a real airplane! We boarded the plane by rows, and some Allison Airlines crew members helped each traveler get bucked in for our flight! Once all of our passengers were safely strapped in (and parents were standing in the wings), I welcomed the class by reciting a poem I had written. 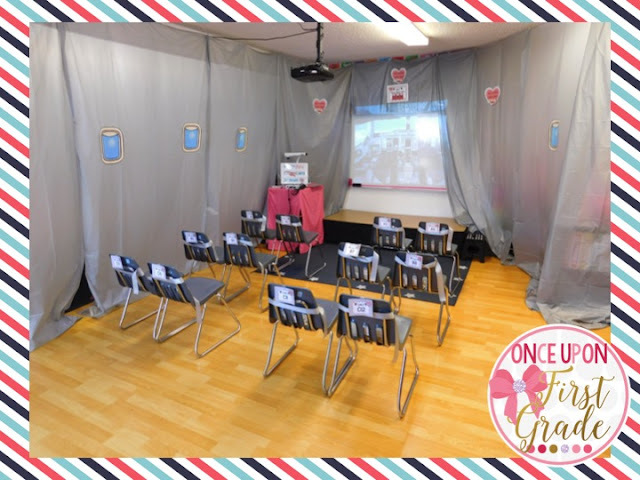 I shared with them how excited I was to soar with them into the many lands of learning we would get to explore, helped the parents know that even if we experience some turbulence as we fly we would face it as a team, and much more! It was a special start to a special year! 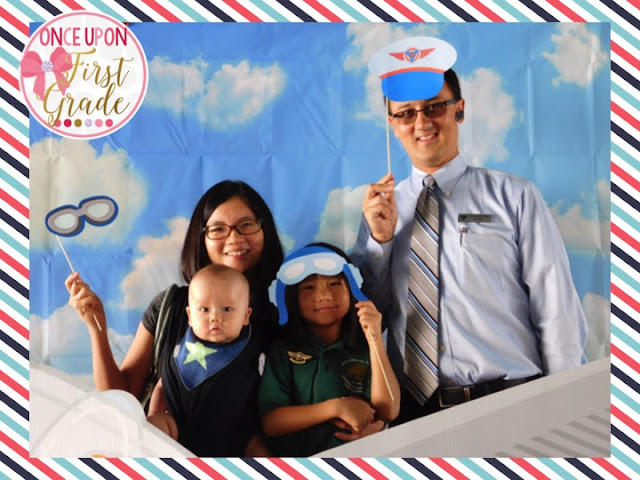 After our short 10 minute time of being in the plane and officially flying into first grade, we deboarded with the parents since it was time for them to leave and for us to start our adventure! All the passengers visited the Baggage Claim area. 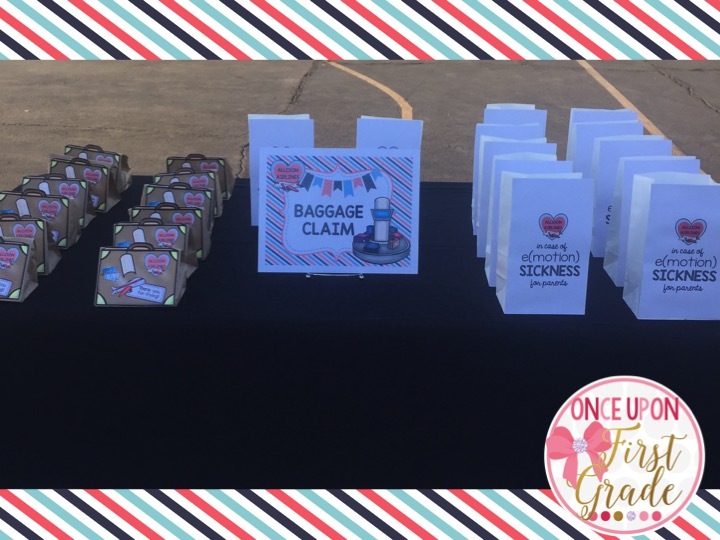 The students each got a special suitcase with treats and the parents each got an "in case of e(motion) sickness" bag with a poem about leaving your child on the first day and some other goodies! Overall, the whole celebration took about one hour! It was short and sweet, but definitely a very memorable and fun day! After the parents left, we flew right into learning and first day procedures! 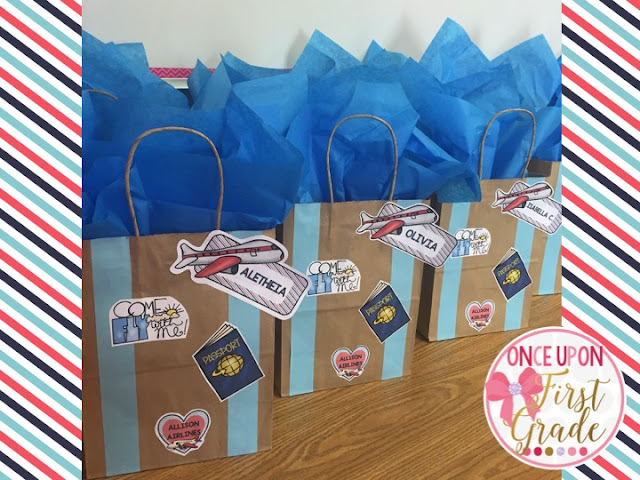 I loved starting the year off with sometime special for my firsties and their parents!! I can't wait to soar with them this year!! For all my teacher friends who are already back, I hope your first few weeks have been awesome! 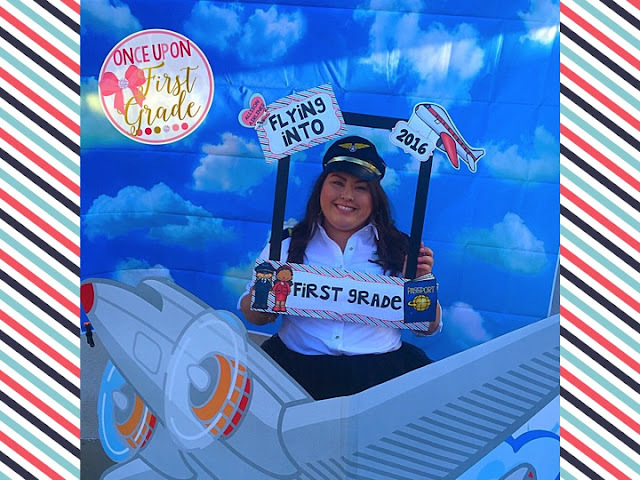 I'd love to hear how you kicked off your first day of school! 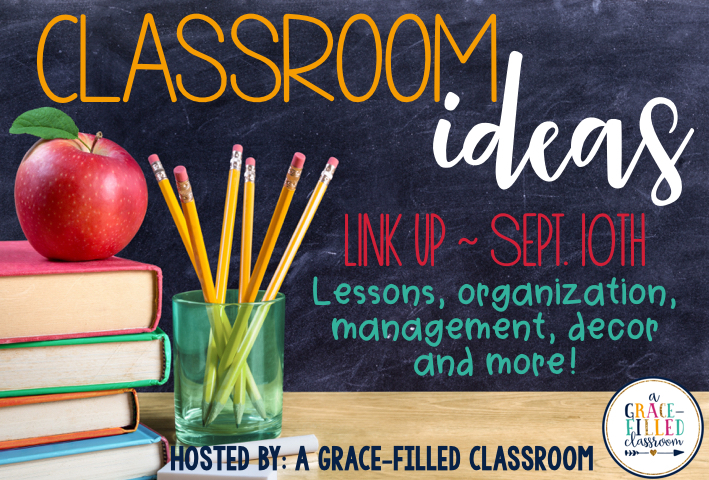 Link up with some of my fav blogger buddies to share some of your classroom ideas!!! Oh my goodness, I'm speechless!! I want to be in your class! How lucky your students have such a welcoming, loving, and creative teacher; you're incredible!! I know they'll all have a fantastic year! !